I am wearing the turtle necklace that you gave me, feeling gratitude and appreciation for this journey because honestly, I feel like a turtle with all my worldly belongings on my back. I pack and repack my things each morning throwing away all unnecessary things without a second thought as each ounce counts, especially at the end of the day. What a message! How important it is to lighten our load, not to carry around stuff that we don’t need to be holding on to. For me that would be worries, unfounded fears, and lingering grudges to name a few. 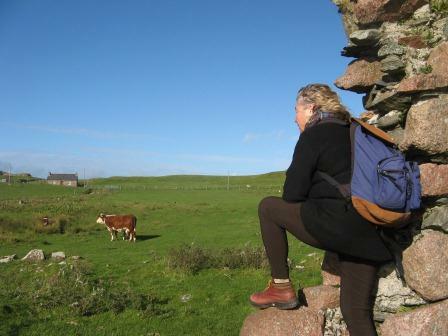 In Iona, when the women set out on various treks I encourage them to fill their back pack with rocks, each of which represent “baggage” that is no longer useful. They are to carry their “burdens” until they decide it is time to release them. Seeing women, standing on a shore, tossing such feelings into the water is always a triumphant scene. What unnecessary things should you consider getting rid of? I did the Camino last May, 2015. Originally, I was going on my Camino by myself. Six months prior to leaving my husband decided he did not want to be away from me for that long. So, he decided to join me. I was somewhat hesitant to have him along, after all this was my journey. The trip was both life affirming, bonding, and somewhat frustrating. I had wanted to be by myself, to prove something. Well it was nice to have him with me, at times it was somewhat challenging. He became ill in the middle of our trip and had to be hospitalized and recuperate, outside of hospital for nearly 2 weeks. At that time I was busy just keeping our lives together, making sure his needs were met, and trying to navigate in a foreign country, where I couldn’t speak the language. Thank goodness for Google translate. We survived, our marriage is stronger than ever, but I still feel the need to get away. I have yet to decide who I am, and what my role in life is, aside from wife, mother, grandmother, and friend. Congratulations on your completion of the Camino. I do plan to go back and complete the 150 miles that we had to miss. This, I will get to do alone or with my daughter and I look forward to it. I am so glad I am not the woman who throws out everything, because if I did I would not have come across your book “A Year By the Sea” last night. The book was given to my by a fellow Retrouvaille presender years ago and has sat on my bookshelf since. Myself and Patrick my husband had presented the 4th Post in a Retrouvaille Programme (a Lifeline for Married couples) and then we headed to our friends 60th Birthday party. We had Irish Ceili Music in the background, beautiful food and chatted to friends and reconnected with others. But as we were so tired we left before the Ceili Dancing started. After the day that was and the title of our talk “Intimacy” I am finding your book so interesting on many levels and my friend has an (R) relating to Retrouvaille marked in different areas. Seeing the couples who are struggling and working on their relationships is heart warming and the transformations inspirational. I couldent wait this am after reading another few pages of your book to check out the web site and what a wonderful surprise. Then I decided to go to your blog and of course the Camino….Top of my list at the moment and Findhorn just down from The Camino. But as we told the couples yesterday – Decide and DO that is my next step. Thankfully at this stage of my life, I have taken so many rocks out of my haversack and now walk with a light load. I love all your books, Joan. I have been wanting to spend a week on a beach, all alone. I am trying to find one that is fairly secluded. 🙂 I love the idea of sitting in your car by the beach for 1/2 an hour. A mini retreat. Thanks for sharing. Fifteen minutes of true silence in nature each day is better than anything. Retreat is not a luxury but rather a necessity…especialy for women who are the carriers of culture. Joan – your thoughts are so on target. I keep your books in my night table for inspiration. So many nights I will open one to a randon page and be inspired again to let go of that which is outlived in my life. Thank you for all the inspiration you give to women. I hope you underline favorite lines…my books are meant to be marked up!